This fight is going to be epic as two giant robots standing at over 10 feet tall and weighing tens of tons will go against each other for the entire world to see. The world first giant robot fight which has been in the making since last two years finally has a date and time. 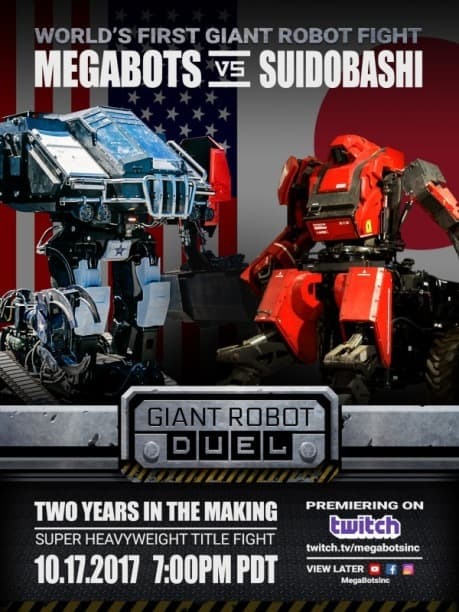 The battle will be held between the American MegaBots Eagle Prime and the Japanese Kuratas. Here are a few stats before we reveal the schedule. The MegaBots Eagle Prime stands at 16 feet and weights 12 tons. The Kuratas build by Suidobashi Heavy Industries is more agile with its 6.5tonne weight and 13 foot height. The fight has been scheduled for October 17th, 2017 at 10:00 PM PDT which means in India you can catch it live on October 18th at 7:30am. You can watch the fight live on Twitch at this link. If you miss do not worry you can catch the recording on YouTube and Facebook soon after the fight gets over. We shall update the links once they are out. Whoa. This is a.m.a.z.i.n.g! Is this for real? That was my first thought. They are making Transformers in real life! That megabot fight is definitely going to grab some roboticist eyeballs.